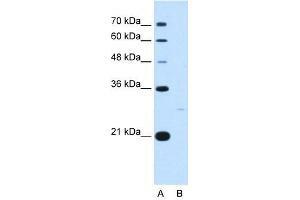 YWHAZ antibody used at 5 ug/ml to detect target protein. Background YWHAZ belongs to the 14-3-3 family of proteins which mediate signal transduction by binding to phosphoserine-containing proteins. This highly conserved protein family is found in both plants and mammals, and this protein is 99% identical to the mouse, rat and sheep orthologs. The protein interacts with IRS1 protein, suggesting a role in regulating insulin sensitivity.